A decade ago, the town of Gilbert, Ariz., and the city of Chandler, Ariz., collaborated through an intergovernmental agreement on the building of the Santan Vista Water Treatment Plant (WTP) in Maricopa County, Ariz. Safety was the driving factor in choosing onsite sodium hypochlorite generation (OSHG) technology for disinfection. The municipalities wanted to get away from the risks and requirements associated with transporting and storing gas cylinders, which Gilbert’s other water treatment plant, North, had been using. By generating disinfectant on site, salt is the only chemical that is stored or transported. At the nearby city of Chandler WTP, operators already were successfully using a De Nora ClorTec OSHG unit. Meeting with the system’s users and seeing the OSHG in action made the decision an easy one: The system is safe and easy to operate, and the operators were happy. In production since 1995, the ClorTec OSHG unit is a safe disinfection treatment method, operating with only three ingredients: salt, water and electricity. In 2008, two ClorTec units producing 1,500 lb per day of chlorine each were installed at the Santan Vista WTP—one for use and one for backup. Since the 2010 U.S. census, Gilbert and Chandler have grown 14% and 5%, respectively, and now have a total population of more than 500,000. Each community occupies approximately 65 sq miles, and each has been among the country’s fastest growing municipalities. Based on the community’s population modeling and numbers, developers knew there would be future demand, and the Santan Vista expansion project, which was completed early in 2018, doubled the plant’s treatment capacity from 24 million gal per day (mgd) to 48 mgd. 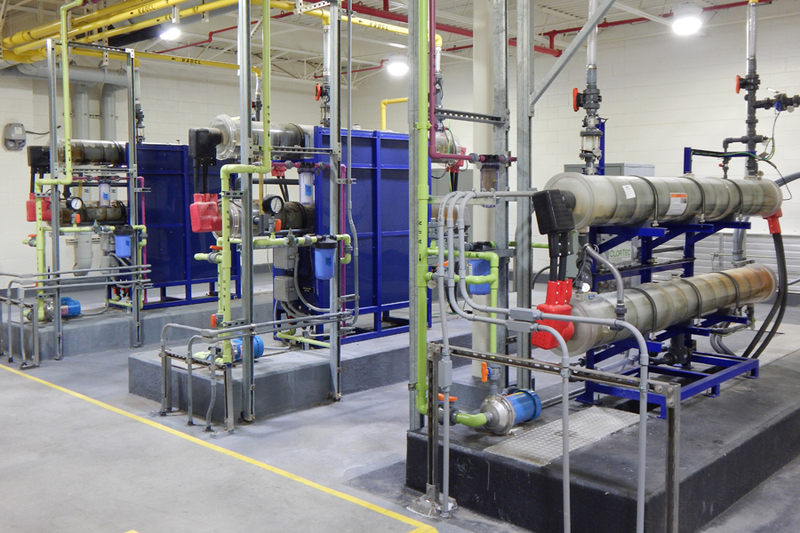 The expansion incorporated several improvements, including the addition of a third ClorTec OSHG from De Nora. Robert Andrews, maintenance and operations field utility supervisor for the Santan Vista WTP for Gilbert, says the decision to expand the OSHG capacity made sense. The average flow this year at the Santan Vista WTP has been 30 mgd, but as the communities build out and population grows, requiring more water, Andrews anticipates that they will need the full 48 mgd capacity. Santan Vista WTP serves 150,000 individuals, meeting or exceeding the environmental regulations put in place by the communities of Gilbert and Chandler. The new next-generation ClorTec DN OSHG is another 1,500-lb-per-day unit. Currently, Santan Vista runs one of the three units exclusively, which is sufficient for today’s needs. With the increased capacity, it is ready for a growing population. The ClorTec DN Gen II includes additional features that add to the system’s safety and efficiency, including the hydrogen venting of each cell, an updated control system, a lower operating temperature and an optional split flow technology to reduce energy consumption.